But never fear, Neil, 54, and keyboard player Chris Lowe, 49, aren’t looking for a fight. Neil’s actually referring to a cancelled gig at Hogmanay 2007, when the duo were set to headline the Edinburgh Hogmanay street party with Paolo Nutini. Usually 100,000 international revellers see in the new year with music and fireworks, but gales and driving rain meant organisers had to pull the plug at the eleventh hour. Stoney-faced Neil admits they were embarrassed at what happened and felt hollow as they tried to party into 2008 at a club in the Scottish capital. But they are ready to show Scots what they are made of in July when they headline the King Tut’s Wah Wah Tent on the Sunday at T in the Park. Neil said: ‘We haven’t played Scotland for a while, the last show, on NewYear’s Eve, was cancelled. ‘We had done the soundcheck and then the storm started. ‘They said ‘it’s going to go ahead’ We didn’t find out it had been cancelled until 8.45pm. It wasn’t a nice feeling. ‘You are all keyed up.You are in your hotel room.You’ve had a bath and a shave.You have put your clothes on for the performance.You are getting ready to go to the site and then suddenly it’s cancelled. ‘It was a very hollow feeling, so disappointing. ‘I was staying in a different hotel from Chris. He was in on Princes Street. It was about 7pm and he was saying ‘I’m sure it’ll get cancelled because there’s a dustbin flying down the street’. While the thousands of revellers were bitterly disappointed, Neil admits he and Chris felt embarrassed. He said: ‘We had got friends and family to come up, so when the show was cancelled we went to a club, but it was a bit downbeat because we felt crest-fallen about what happened. ‘We actually felt embarrassed in a way because it’s very rare to cancel a gig, especially on the day. ‘We once had to postpone a gig in Miami because of a problem with the sound equipment, but we did the gig the next day. Since their first No.1,West End Girls, 23 years ago, the Pet Shop Boys have continued to be a feature in the charts and saw their talent honoured at the BRITs in February. 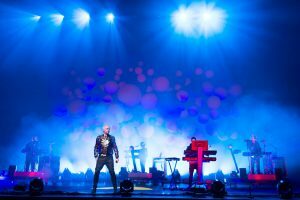 While other Eighties acts have had to hit the nostalgia circuit or reality shows, the Pet Shop Boys are still a musical force – their 10th album, Yes, is currently at No.4. For Neil, being one of the T in the Park headliners is also exciting because his father’s family are Scottish. Despite being seen as the quintessential Englishman, Neil is quick to point out that although he was born in North Shields, near Newcastle upon Tyne, he is ‘100 per cent Celtic’. ‘On my father’s side, I’m Scottish, and on my mother’s side, I’m Irish,’ he added. ‘I have a Scottish surname and my dad’s family came from Edinburgh, although they moved to Newcastle. Neil and his sister and two brothers also spent many happy holidays in Scotland. Neil revealed: ‘As kids, we always went to Scotland.We’d drive up to Edinburgh for the day or for longer holidays go to FortWilliam or Crieff Hydro. I used to love Crieff Hydro, it was like Gormenghast. ‘As a child of about nine, it was very exciting to be in this hugeVictorian building. ‘We used to go down and have a five course dinner and my mother would tell us what cutlery to use. While T in the Park will be the duo’s first Scottish festival, they have become festival veterans of late, headlining all the big European festivals such as Denmark’s Roskilde, the Serbian Exit Festival, and Spanish festivals Sonar and Benicassim. ‘We do a lot of the hits and people sing along and have a good time. ‘Of course, it’s more of a challenge. If you are on tour, people buy tickets to see you, but at a music festival they may have bought tickets to see The Killers but come and see you anyway. ‘You feel proud if you win them over. So we are looking forward to playing T in the Park. ‘It will be very different from The BRITs but still theatrical and hi-tech. I thought T organisers had something against us so we are very happy they’ve invited us this year.’ It’s already been a great 2009 for the Pet Shop Boys, kicking it off in style at the BRITs in February when they were given the Outstanding Achievement Award. Showing just what they meant to generations of musicians, pop singer of the moment Lady GaGa and The Killers’ Brandon Flowers joined them on stage during a string of hits. Neil admitted: ‘You think of the Outstanding Contribution Award as being a sort of a rock thing and I thought it was nice it was going to something overtly pop for a change. ‘It is quite nice because actually 2009 is 25 years since we first released a record, so that sort of time thing makes it seem appropriate. New albumYes is certainly pure pop, and that’s because it was produced by current hitmakers Xenomania, who are behind tunes by Girls Aloud, Kylie, Sugababes and Cher’s huge No.1 Believe. As they began writing, Xenomania took one of the songs, The Loving Kind, and gave it to Girls Aloud who had a top 10 hit with it. While the Pet Shop Boys collaborated with RobbieWilliams on two songs for his Rudebox album – We’re The Pet Shop Boys and She’s Madonna – it seems Kylie Minogue wasn’t quite so keen. Although Neil and Chris offered her tracks for her last album, X, she didn’t even record them. Neil said: ‘Pandemonium was written for Kylie two years ago.We were asked, like many song-writers in London, to write for her and we did a few things.We really liked this song, but it didn’t end up on her album. ‘When I was writing the lyrics, I was thinking of Kate Moss and Pete Doherty, so when you listen to it, think of it being sung by Kate about Pete, as that was pretty much the inspiration for it. And, of course, Kylie’s loss is Pet Shop Boys’ gain.